The newly crowned Conference USA champions traveled to Xavier for a rare February nonconference game and lost to a team currently sixth in the Atlantic 10 standings. That hum you hear is the nationwide harmonizing of C-USA critics. Memphis can beat up on its inferior league brethren, but . . . .
Down 31-20 at halftime, the Tigers staged a rally in the second half built largely on a flurry of three-pointers over a three-and-a-half-minute stretch. Junior guard Geron Johnson (from nearby Dayton, Ohio) hit a trey from the right corner at the 9:50 mark to pull the Tigers within five points (41-36). With two from Chris Crawford and two more from Johnson, Memphis took its first lead of the night (50-49) with 6:25 left in the game. A dunk by Tarik Black gave the Tigers a 52-49 lead, but the margin would not be extended. A driving layup by Joe Jackson with 1:55 on the clock gave the Tigers their last lead of the night (57-55), as Xavier's Brad Redford hit a three-pointer on the Musketeers' next possession. Johnson missed the first free throw on a one-and-one and D.J. Stephens missed a pair from the line with just over a minute to play. Down 60-59 with 29 seconds to play, Tiger coach Josh Pastner used a timeout to set his offense. Jackson took the inbounds pass, drove into the lane and dished to a wide-open Crawford in the left corner. Crawford's shot was awry, though. Down two after a missed free throw by Travis Taylor at the other end, Stephens pulled down a rebound only to throw his outlet pass off of Crawford's knee. With Xavier up 64-61 with 1.5 seconds on the clock, the Tigers attempted a desperation pass-and-shoot from under the Musketeer basket. Stephens drew a foul, made the first free throw, then failed to hit the rim on an intentional miss, giving Xavier possession . . . and the win. The Tigers were led on the scoreboard by Johnson (14 points), Jackson (11), and Crawford (10). The loss ends the Tigers' 18-game winning streak, the team's longest in four years under Pastner. (The U of M's 11-game road winning streak is also over, a run that dates back to the 2011-12 season.) They'll next play Saturday at UCF, with hopes of remaining undefeated in C-USA. What remains to be determined is how impressed the NCAA tournament-selection committee will be with the Tigers' C-USA record, spotless or otherwise. I love rankings. And the more subjective the better. Whether it’s U.S. presidents or swimsuit models, books, movies, or NFL linebackers, I love the debate stirred by a good, well-considered ranking. And I love the feedback I’ve received on my ranking of the top 15 Memphis Tigers of all time. (I’ve taken to calling this bunch the “Fine Fifteen.”) As subjective as the day is long, the ranking was, in fact, well considered. Two spots in the ranking were open as I was writing the final draft. There are probably 30 current or former Tigers who could make a case for being members of the Fine Fifteen. But I’m sticking with my selections. I will share, though, some thoughts on that feedback. • Keith Lee was a power forward! Penny Hardaway was a small forward! I understand Keith Lee played power forward from 1981 to 1985, alongside centers Derrick Phillips and William Bedford. Particularly considering Phillips and Bedford didn’t make the cut for the Fine Fifteen, I felt moving a 6’10” rebounding machine to the pivot would not do major damage to the list of players as I composed it. That said, I’ll confess to a late decision that locked Lee into the center position. I wanted Ronnie Robinson on my “first team,” atop the power forward rankings. The last cut I made was Bedford, in favor of David Vaughn (a power forward who actually played in much the same way Lee did a decade earlier). Instead of calling Vaughn a center (and placing him third, behind Lorenzen Wright and Joey Dorsey), I placed him at power forward (behind Robinson and Forest Arnold). And I remain quite comfortable with Keith Lee starting at center for this fantasy team. With Lee between Robinson and small forward Rodney Carney, a pair of guards from the Washington Generals would keep this team undefeated. As for Hardaway, come on. As I wrote, Hardaway “could actually fit any of three positions.” Memories of Penny as an All-NBA point guard may have influenced his placement on this team (directly between the point and small forward). If I were to make a revision, though, it would be to slide Hardaway in front of Carney at small forward, then move Win Wilfong from second among small forwards to second among shooting guards. It’s hard to picture an alltime Tiger starting five without Penny in the lineup. Last thought on positions: this is basketball, not baseball. I didn’t put a shortstop in rightfield or a second-baseman behind the plate. • Any ranking of greatest Tigers has to include Larry Kenon! 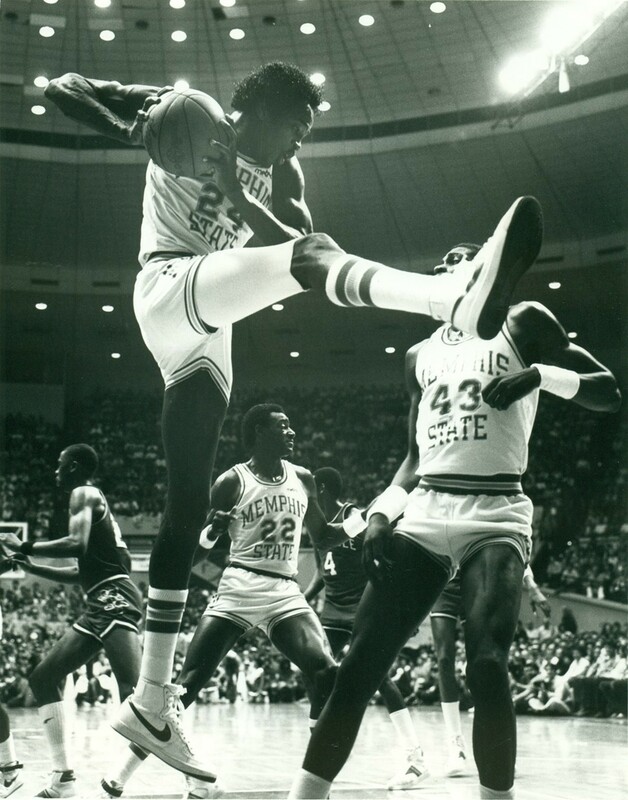 The safest number in the Memphis record book is Larry Kenon’s 501 rebounds in 1972-73. (Second on the chart: 372 by Robinson in 1971-72 and Wilfong in 1956-57.) Had Kenon played a second season as a Tiger, he’d have a Fine Fifteen jersey today. Unfair to exclude one-year wonders? Rankings are unfair. • But you overlooked [several great Tigers]! Doom Haynes should be on this team for his nickname alone. Not just the best moniker in Tiger history, but in all of college basketball. One reader called Bobby Parks “the best all-around Tiger ever.” (Take that, Penny.) Another called James Bradley the “best forward, period.” (Take that, Keith Lee.) Cheyenne Gibson deserved consideration. Cedric Henderson and Dexter Reed are the top career scorers not among the Fine Fifteen. Chris Garner was an electric point guard over Larry Finch’s last four seasons as coach. Alas, it’s a Fine Fifteen. Not a sweet 16 or top 20. Fifteen faces and stories that — undeniably, regardless of position — helped make the University of Memphis basketball program the civic treasure it’s become. The Tigers won their second straight Conference USA regular-season championship Saturday with a rather thorough dismantling of the league's second-best team. A midcourt steal followed by a breakaway dunk by junior guard Geron Johnson spurred an 18-3 run to end the first half, giving Memphis a 46-30 lead. Southern Miss would get no closer than 12 the rest of the way as the 21st-ranked Tigers secured their 18th consecutive win and improved to 24-3 on the season. "To win a conference championship over a two-and-a-half-month period . 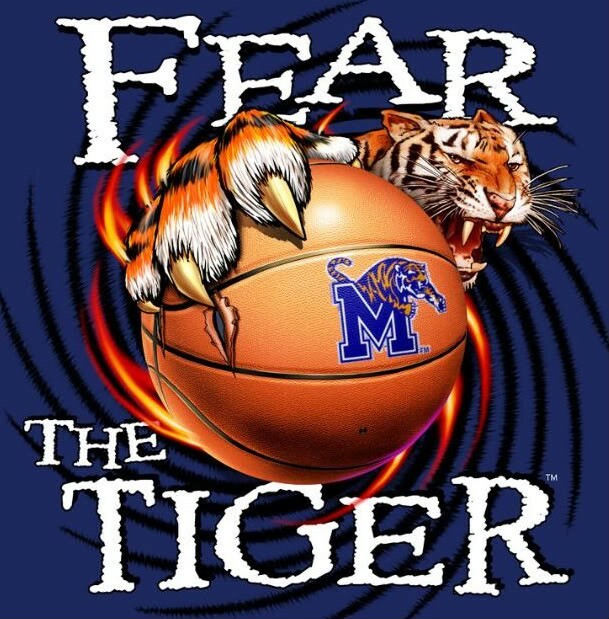 . . that's not easy to do," said Memphis coach Josh Pastner after the game. "Especially when you're picked to win it, and you're getting everyone's best shot. To fight through all the negativity back in November, to stay together and get to this point is a tremendous testament of character to these young men." Memphis fans likely saw the last of a longtime Tiger rival as Southern Miss will remain in C-USA when the U of M moves to the Big East next season. The victory was the 40th for Memphis in 48 games against the Eagles here in the Bluff City. Senior guard Dwayne Davis did all he could to keep things tight, scoring 18 points in the first half and 28 for the game. His efforts, though, were thwarted by a Tiger team that shared the ball exquisitely with 25 assists on 29 field goals. It was the fifth time in seven games Memphis has accumulated at least 20 assists. Johnson had seven helpers, Shaq Goodwin five, and Joe Jackson and Chris Crawford four each. "We're an unselfish team, spreading the ball around to everybody," said Jackson, who added 15 points to his line. "We feed off each other. When you've got four or five guys who can pass, shoot, and dribble, it makes the game easy. We won a conference championship last year, but it's so different. We pay attention to detail better than we did last year. We're more unselfish. There are good teams and bad teams in the conference; Southern Miss is a good one. But we've got to treat everyone like they're good." Junior guard Chris Crawford heated up late in the first half, hitting four three-pointers to help fuel the burst before halftime. He finished with five treys (tying a career high) and scored 19 points. D.J. Stephens scored 16 points (three more dunks) and blocked five shots. Goodwin added 19 points, his most since the December 5th win over Ohio. "Two of our goals before the season were a conference championship and an NCAA championship," said Goodwin. "We got one of them, so let's go on to the next. We know we have a team full of scorers, but we have to play together. This is more than basketball. We decided to look at this as something bigger, like life. I'm from out of town, so these are basically my brothers. Every time we go out there, we say 'Play for your brother next to you.' "
Pastner continues to relish the winning streak, the fifth-longest in the proud history of the program. "It shows you how great this program is, so much bigger than any coach or player," he said. "We've got 18 wins in a row. For most teams, that would be the longest in the history of the program. Here, it's fifth. That's crazy. It shows you how great the tradition is here. You're witnessing some beautiful basketball." The Tigers won't return to FedExForum until March 9th (Senior Day). They travel to Cincinnati for a rare February nonconference tilt against Xavier on Tuesday. They'll then travel to UCF and UTEP before returning home. NOTE: Pastner said there is a slight chance junior guard Antonio Barton — sidelined with a broken foot — could return for the March 9th game against UAB. 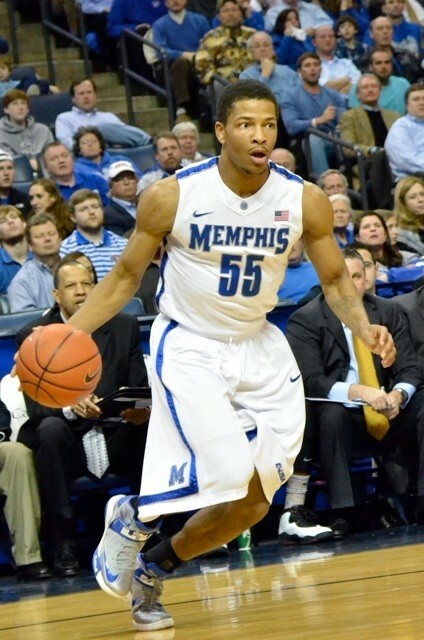 More likely, he'll be in uniform when the Tigers play their first game at the C-USA tournament on March 14th. With five seconds left in tonight's game at FedExForum, Adonis Thomas received a pass from Chris Crawford under the Houston basket, the Cougar defense conceding the final moments of the Tigers' 17th straight victory. With 11 points, 13 rebounds, and nine assists, Crawford was a Thomas layup away from the Memphis program's fourth triple-double. Alas, Thomas dribbled out the clock . . . standard protocol under coach Josh Pastner for a secured win. "I feel bad for Chris," said Thomas after the game, but with a smile on his face. "We were joking about it in the locker room. We try to be respectful of the other team. But Chris is such a team player, gets us all involved. I apologized to him. I just tried to do the right thing." Crawford's performance was merely one of four stand-out efforts for the U of M tonight, each of them needed as the pesky Cougars lingered until the final minute of play. Junior center Tarik Black came off the bench (like Crawford) and had his best game in two months, hitting seven of nine field-goal attempts for 15 points in 23 minutes. (Let it be said that Crawford and Black as a tandem give Memphis the best bench in Conference USA.) Thomas scored 20 points for the second straight game (22) and D.J. Stephens contributed 14 points (10 of them coming on dunks) and 10 rebounds. The Tigers seemed to take control early with a 13-0 run that gave them a 25-15 lead just over 11 minutes into the game. But the Cougar trio of Danuel House (16 points), TaShawn Thomas (20), and Joseph Young (22) kept the visitors close enough to make things uncomfortable for Pastner and his staff. A jumper by House four minutes into the second half tied the game at 39. A Crawford trey and Black's inside presence, though, helped the Tigers extend their lead to 15 with just under eight minutes to play. A Thomas dunk closed the gap to six points (75-69) with 55 seconds left, but the Tigers made their free throws down the stretch (two from Thomas and two from Crawford) to seal the win. Black's emergence — in a season of ups and downs for the captain — could prove integral to any postseason hopes the 21st-ranked Tigers might harbor. "When Tarik gets his game going, it opens up the perimeter and allows us to attack," said Thomas. "But when he's dominating like he was tonight, we want to feed him the ball to reward him for his hard work on defense." Crawford knows more assists will come if Black is scoring inside. "I kept telling guys to keep going back to Tarik, consecutively," said the junior from Sheffield High School. "He's been dominant in practice lately, and that just carried over into the game. He was really aggressive, unstoppable down there." The win improves the Tigers' record to 23-3. Memphis can clinch C-USA's regular season title with a win over Southern Miss Saturday at FedExForum and is now four games away from a spotless (16-0) farewell tour of C-USA. How far this Memphis team might go in March with an under-performing Adonis Thomas is one thing. How far the team might go with the former McDonald's All-American playing like the future pro most scouts think he is . . . that's another thing. The pride of Melrose High School scored a career-high 23 points tonight at Marshall and, with 10 rebounds, achieved his first double-double as a Tiger to help the nation's 22nd-ranked team beat the Thundering Herd for its 16th straight victory. The Tigers improve to 22-3 on the season, 11-0 in Conference USA play. Marshall jumped out on top, 10-3, only to suffer a 22-5 run at the hands of the Tigers. Thomas scored 10 points in the game's first seven minutes and had 15 by halftime. Reserve forward Ferrakohn Hall matched his season high with eight points before the break and Memphis led 43-26 after 20 minutes. The Tigers missed their first seven shots of the second half and saw their lead diminished to five (46-41) midway through the period. But just as he did at Tennessee and at SMU, junior guard Geron Johnson rose to the occasion with daggers from the outside, burying a trey to extend the Memphis lead to 49-41 (at the 10:25 mark), then another for a 56-43 lead with 8:18 left to play. A three-pointer by DeAndre Kane brought the Herd within nine (64-55) with 3:14 to play, but the outcome would not be in doubt the rest of the way. The Tigers won despite two rotation players (D.J. Stephens and Tarik Black) fouling out. They won despite Stephens, Black, Shaq Goodwin, and Chris Crawford combining for 15 points. Junior guard Joe Jackson scored 12 points and Johnson finished with 11. The 16-game winning streak is the fifth-longest in Tiger history. The Tigers return to action Wednesday night when they host Houston at FedExForum (tip-off is scheduled for 8 p.m.). "It's not a birthright to win 15 games in a row. It's not a birthright to have another 20-win season. It's not a birthright to win 10 league games." Having won his first game since November with his team in the national rankings (#22), Tiger coach Josh Pastner opened his postgame press conference with heavy emphasis on the challenges his club has faced over the last three months, among them the continued perception that Memphis is fattening its record against inferior Conference USA competition. "If you don't believe this league is good — that everybody is good — then you're living in the Eighties or Nineties," he said. "Hey, I loved that music, too, but it's the past." The Tigers enjoyed their second impressive, start-to-finish beat-down of a team considered a legitimate threat to their untarnished conference record (now 10-0). 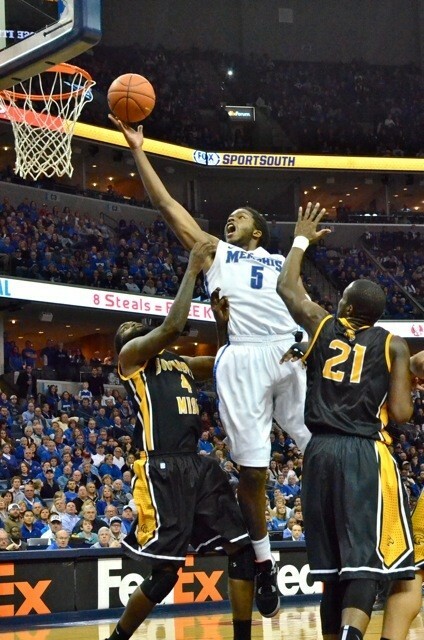 After falling behind 8-2, Memphis awoke with a pair of thunderous dunks from senior D.J. Stephens (including the 100th of his Tiger career), one on which he seemed to turn right in midair before slamming the ball through the net. Tied at 19 with eight minutes to play before halftime, the score turned permanently in the Tigers' favor as the Memphis defense continued to stifle Knight stars Keith Clanton (three for 10 from the field for 10 points) and Isaiah Sykes (17 points but nine turnovers). With 10 points and five boards from Stephens, the Tigers entered the break with a 42-36 lead. Adonis Thomas scored seven points in the first four minutes of the second half to extend the Tiger lead to double figures (55-42). Shortly after a Kasey Wilson three-pointer brought UCF within eight, the Tigers erupted with a 22-4 blitz, sparked by three consecutive treys, two from Chris Crawford and one from Johnson. The Tigers cruised to a 22-point win despite the Knights finishing the game on an 11-2 run. Johnson was again central to the fast pace the Tigers played, finishing all too close to the program's fourth triple-double (19 points, 9 rebounds, 8 assists). With the offense seeming to flow through his hands, the Tigers outscored UCF 27-7 on fastbreak points. "We're finding out our identity," said Johnson. "We're really devoted to being a transition basketball team. Pushing the pace. We've got some of the fastest guys in the country: Joe Jackson, Chris Crawford, Adonis, myself. But you've got to finish plays. You don't want a million-dollar look and a one-cent basket. Coach [Damon] Stoudamire talks about the 'hockey assist,' the extra pass. Whether it's me or someone else [making that pass], it doesn't matter." Jackson was on the receiving end of a few of Johnson's transition passes, finishing with 21 points and 10 assists himself. The junior guard — presented with a commemorative ball before the game for recently scoring his 1,000th career point — converted 10 of his 13 field-goal attempts. Jackson likes the national ranking, and said it's one more motivating factor for a veteran-led team. "We can handle [the ranking]," he said. "This is a new situation for us, and it may work out for the best. We've got a lot more games; if we can just go on a run, we can do something that other [Memphis] teams have done, but would be special for this team right here." As for the furious pace of the last two games [the Tigers scored 89 points in beating Southern Miss last Saturday], Jackson likes the formula. "It's like a hot potato out there . . . guys giving [the ball] up," he said. "Everybody's getting out early, making plays. It makes the game easy." Thomas enjoyed his third straight game in double figures with 17 points. Crawford added 10 points and four assists. Memphis outrebounded the Knights, 40-22. Next for the Tigers will be a road game at Marshall on Saturday. The Tigers edged the Thundering Herd, 73-72, on January 26th. Tiger coach Josh Pastner loves D.J. Stephens. And there’s much to love about the gravity-defying senior forward, certainly the most popular Tiger since Joey Dorsey grabbed his last rebound five years ago. Pastner has enjoyed teasing the media this winter by proclaiming Stephens one of the “top five Tigers” of all time. He’ll acknowledge three other top-fives (Larry Finch, Keith Lee, and Penny Hardaway), then leave one slot open for us keyboard-tappers to consider. The cold truth, of course, is that Stephens isn’t even among the top 15 Memphis Tigers of all time. The program has been too good for too long for a player with Stephens’s limited numbers to qualify among the top ten, let alone a top five. Below is one man’s ranking of the top three Tigers at each of basketball’s traditional positions. Consider it in no way a rebuke of all Stephens has given the 2012-13 Tiger team. It’s more a commentary on the historical strength of a program he’s helped thrive. NOTE: My one qualifier for this ranking is that a player had to have suited up for at least two seasons with the Tigers. The “one-and-dones” were fun to watch, players like Larry Kenon, Dajuan Wagner, Derrick Rose, and Tyreke Evans. But they don’t belong on this list. One of only two Tigers to score 2,000 career points (2,209), Socks led the Tigers in assists and steals all four seasons he played and led the team in scoring his last three seasons. He’s second in career steals (304) and fifth in career assists (546). The Little General was the pulse of the Tiger program for a glorious four-year period that included a trip to the Final Four in 1985. He holds the Tiger record for assists in a game (15), season (262), and career (763). Turner averaged 7.7 assists in 1985-86. The highest average since: 6.4. Like the two players above him, Wright led Memphis in assists all four seasons he controlled the ball, but is one of only two Tigers to average more than five assists in three different seasons (the other is Antonio Burks). Wright increased his scoring average from 7.9 as a freshman to 15.5 as a senior. His 1,319 career points rank 15th in Tiger history. Now and forever, the greatest Tiger of them all. 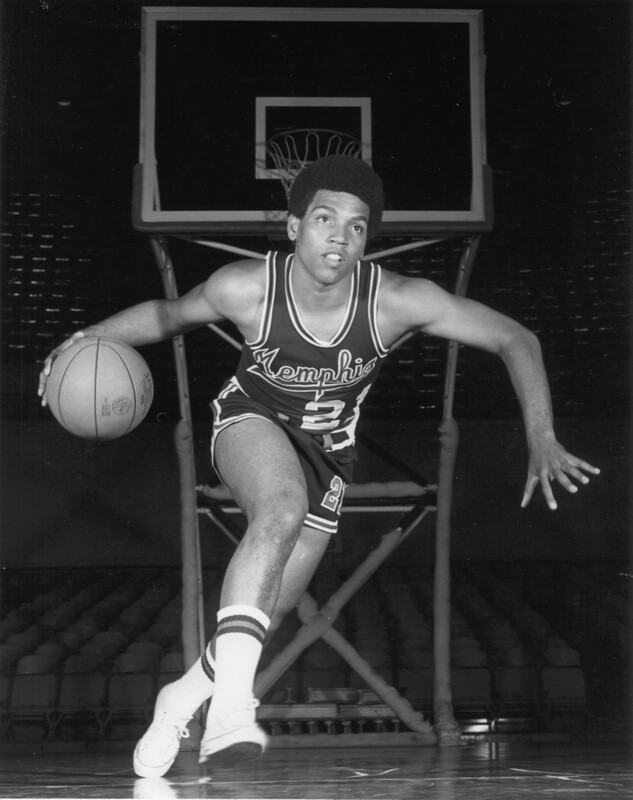 Freshmen didn’t play in Finch’s day, but he still scored 1,869 career points, averaged 23.9 in 1971-72, and remains the face of the fabled 1972-73 team that reached the NCAA championship game only to fall to mighty UCLA. There should be a statue of Finch somewhere, anywhere in Memphis. The 1993 first-team All-America could actually fit under any of three positions on this list. Averaged 20.0 points per game over his two seasons while delivering the kind of passes we’ve seen only from the likes of Magic Johnson and Jason Kidd. Twice MVP of the Great Midwest Conference, Penny owns two of the program’s three triple-doubles. It’s fitting that Anderson has the only non-Penny triple-double in Memphis history. The “glue guy” for a remarkable period that saw a trip to the national championship game in 2008 and two Elite Eight appearances, Anderson is the only Tiger with 1,000 career points, 500 rebounds, and 500 assists. Should have his number hanging from the rafters of FedExForum. A second-team All-America in 2006, Carney combined the arts of high-flying dunks and three-point marksmanship unlike any Tiger before or since. His 287 career treys are 45 more than the next Tiger on the chart (Anthony Rice). Surpassed 600 points as both a junior and senior. His 1,901 career points are third in Memphis history. A 6’2” swingman, we’ll put Wilfong at forward based on his playing days in the 1950s. Played only two seasons with the Tigers but averaged 22.1 and 21.0 points, leading Memphis to the 1957 NIT championship game. He was the program’s first All-America, earning first-team honors from Converse in ’57. CDR is one of only three Tigers to earn first-team All-America recognition from the AP. He averaged 18.1 points per game for the 2007-08 squad that went 38-2 and lost in overtime to Kansas in the national championship game. His 724 points that season are the third highest in the program’s history. Larry Finch’s running mate at both Melrose and the U of M, Robinson averaged 14.2 rebounds a game as a sophomore, then 13.3 as a junior. He’s fifth in Tiger history with 1,066 career rebounds and averaged 13.9 points over his three seasons. His number 33 has long been retired by the program. 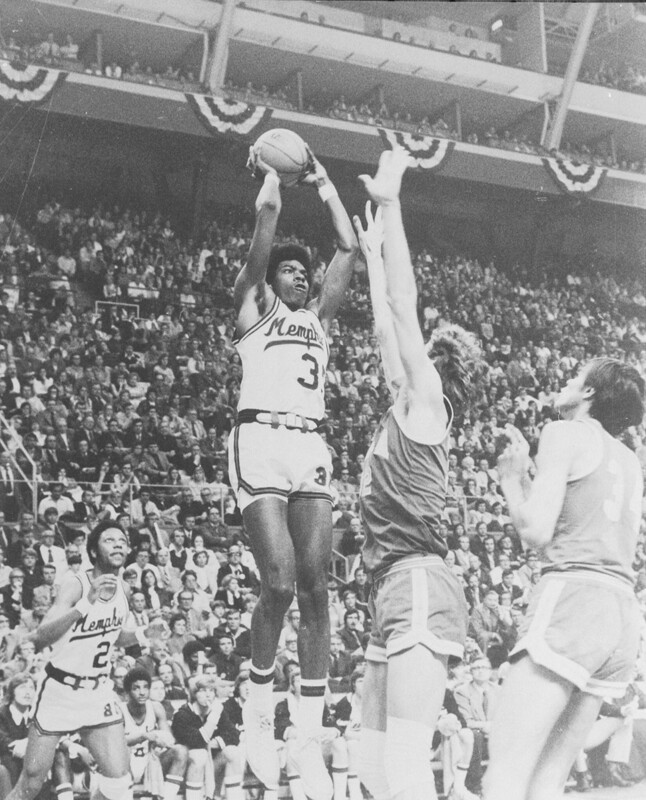 Arnold was the alltime leading scorer at Memphis (1,854 points) until Finch came along. He’s one of only four Tigers to score 1,000 points and grab 1,000 rebounds and starred for the Tigers’ first NCAA tournament team in 1955. For some reason, the school needed until 1995 to retire his number (13). Overshadowed first by Hardaway and later by Lorenzen Wright, Vaughn was an integral member of Tiger teams that reached the NCAA tournament’s Elite Eight (1992) and Sweet Sixteen (1995). Despite being limited to three seasons by a knee injury at the start of his sophomore campaign, Vaughn ranks seventh in rebounds (903) and third in blocks (235) on the Tiger chart. He was the star of Tiger teams that reached at least the NCAA’s Sweet 16 each of his four seasons. An AP All-America all four seasons (first-team as a senior), Lee is atop the program’s list of scorers (2,408 points), rebounders (1,336), and shot blockers (320). Among all the Tigers who left school early, Wright is the one I most wish had stayed. He scored 1,026 points and averaged more than 10 rebounds over his two college seasons, during which Memphis went 46-18. He was chosen by the Clippers with the seventh pick of the 1996 draft and played in more NBA games (779) than any other former Tiger. Twice named C-USA’s Defensive Player of the Year, Dorsey is second only to Lee in career rebounds (1,209) and blocked shots (264). He’s the third member of the 2007-08 NCAA finalists to make this list and arguably the most popular Tiger of this young century. At least until D.J. Stephens arrived. As for my top five? Forget the order: Finch, Hardaway, Lee, Perry, Robinson. With March less than three weeks away, the Tigers took the floor today in Hattiesburg, Mississippi, like they had something to play for. Taking the floor against a Southern Miss team that had won 23 straight on its home court, Memphis hit 15 of its first 20 shots, starting with an alley-oop dunk by D.J. Stephens (from Geron Johnson) not ten seconds after the opening tip. With star turns from Chris Crawford, Johnson, and even Adonis Thomas, the Tigers took the lead for good midway through the first half and never allowed the Golden Eagles to get closer than three points after halftime. Over the game's first 20 minutes, Memphis shot 65 percent, with Crawford draining four three-pointers and Johnson setting an offensive pace unlike any Tiger fans have seen this season. (Consider Memphis made more field goals in the first 15 minutes of today's game than they did in all 40 minutes last Wednesday night at SMU.) Thomas hit a short jumper at the buzzer (after a missed free throw by Southern Miss) to give the Tigers a 47-39 lead at the break. Led primarily by sophomore guard Dwayne Davis (25 points for the game), the Golden Eagles pulled within three (54-51) early in the second half. But a three-point play by Thomas extended the Memphis lead to eight with 10:40 to play and Johnson delivered a dagger at the 8:45 mark, draining a trey to give the Tigers a 68-61 lead. Supporting Johnson's afternoon was Crawford with 16 points and Thomas and Stephens with 11 each. The Tigers shot 56-percent from the field to earn their 14th straight win and give the program its 13th straight season with 20 victories. Now 20-3, Memphis should emerge with Top 25 consideration when the polls are released on Monday. The Tigers return to FedExForum for their next game, Wednesday night against UCF. At halftime tonight in Dallas, the Tigers had four assists, seven turnovers, and 22 points. Happily for coach Josh Pastner and his squad, the SMU Mustangs missed 20 of their first 25 shots and only had 17 points at the break. Memphis survived a second straight nail-biter on the road to earn its 13th consecutive win and improve to 19-3 on the season. With UCF's victory over Southern Miss, the Tigers now own sole possession of first place in Conference USA with an 8-0 record in league play. The U of M and Golden Eagles (18-5) will meet this Saturday in Hattiesburg. Tiger freshman center Shaq Goodwin was charged with a flagrant foul when he slammed SMU's Jalen Jones to the floor late in the second half. Not only was Goodwin ejected from the game, but he'll likely face a suspension and miss Saturday's game at Southern Miss. The Mustangs used an 8-0 run to close a 12-point Memphis lead to 34-30 with 12 minutes to play in the game. Junior guard Geron Johnson hit a trey to extend the lead back to nine (43-34) with just over six minutes left, then hit another three-pointer for a 48-40 Memphis lead with four minutes left on the clock. Coach Larry Brown's team wouldn't get closer than five points the remainder of the game. Johnson led all scorers with 19 points and sophomore forward Adonis Thomas had his best game in a couple of weeks with 14 points and nine rebounds. But most of the numbers from Moody Coliseum were ugly. Despite Johnson hitting five of nine three-point attempts, the Tigers shot 29.8 percent for the game, while SMU shot 31.1 percent and missed 11 of 12 three-point tries. Nick Russell led SMU (12-12) with 17 points. Juniors Joe Jackson, Chris Crawford, and Tarik Black combined to make three of 16 field-goal attempts for Memphis. Particularly if Goodwin is sidelined, the trio will have to step up for the Tiger winning streak to reach 14 games. Tulsa coach Danny Manning enjoyed his share of dominant games during his All-America playing days at Kansas. So the first-year head coach surely appreciated what Tiger senior D.J. Stephens did Saturday afternoon: four dunks, a three-pointer, four blocks, nine rebounds, and a career-high 15 points. That was in the first half. The Tigers' surpassing "energy guy" was hardly needed in the second half, as the U of M extended a 17-point lead and finished off its most complete game of the year, the team's 12th straight victory. Stephens finished with 15 points, 13 rebounds, and five blocks in merely 16 minutes of game action. The two dunks and two jumpers he delivered in the game's first five minutes — staking the Tigers to an 11-3 lead — were really all the home team needed. "That was a good 40 minutes of basketball, a good win for us," said Memphis coach Josh Pastner. "We still have room for growth, but we got the W. We put two halves together." Pastner wouldn't allow his squad — notorious this winter for taking large leads then watching them disappear — to backpedal against an outsized Tulsa team. Barely two minutes into the second half, he didn't like what he saw, so substituted five players from the bench as a single unit. "I didn't feel like we came out with the intensity we should," said Pastner, "so I made the change. And that group extended the lead." That group — Tarik Black, Chris Crawford, Antonio Barton, Ferrakohn Hall, and freshman Damien Wilson — delivered a 15-5 run over the game's next six minutes to extend the Tiger lead to 27 (66-39). The last 12 minutes of the game were essentially garbage time. But garbage time dominated by the Tigers. "We play a lot better when we go out there and have fun as a team," said Stephens. "We play our best basketball when we look to help the next guy out and we play together. A lot of shots were falling for us today. 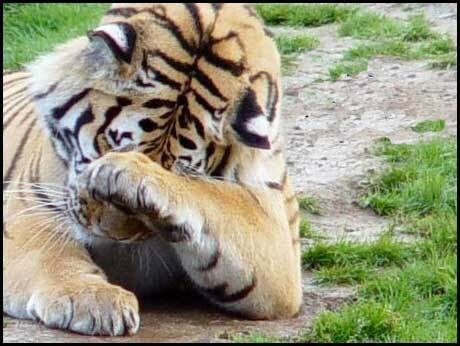 [The Tigers hit a season-high 12 three-pointers.] We showed everybody that we could put two halves together. Everybody was just having fun. It's like a domino effect." Supplementing Stephens' starring role were Barton (a game-high 16 points and four treys), Crawford (12 points, three treys, and five assists), and Wilson, who scored five points and grabbed five rebounds in 16 minutes, his most playing time of the season. Ten Tigers played at least 10 minutes and six of them hit at least one three-pointer. 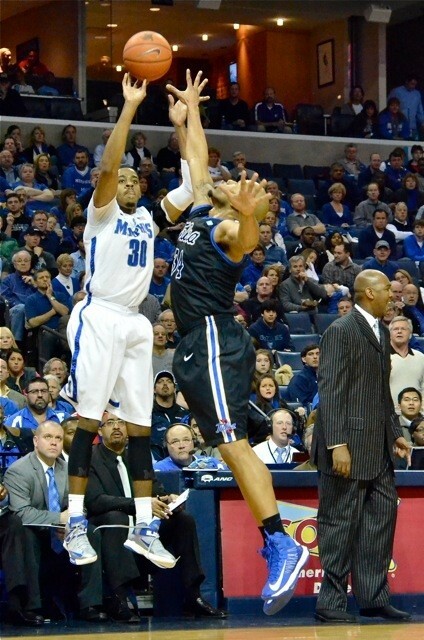 Memphis dished out 25 assists on 32 made field goals and outrebounded the Golden Hurricane, 45-33. If there was a down note, it was junior guard Joe Jackson's streak of games with at least 10 points ending at 16 (he had six in 22 minutes). With his team now 7-0 in league play, Pastner again defended the integrity of Conference USA, emphasizing that margin of victory (like today's) can be nice, but it's all about accumulating wins, however they come. "Winning 12 straight games is not easy," he emphasized. "There are no freebies. We haven't hit our ceiling . . . we need to keep improving." "We have to stay focused on the defensive end, and execute on the offensive end," added Stephens. "We've got a big week coming up, with two road games against two good teams. But today was the first game I've seen everybody happy, everybody having fun. We've won games, but we haven't won them the way we're supposed to. Today's game . . . that's what I've been talking about, winning the way we're supposed to." The Tigers (18-3) travel to SMU for their next game Wednesday night. They'll play at Southern Miss a week from today before returning to FedExForum to face UCF on February 13th.